Review 46. Mary E. Pearson - The adoration of Jenna Fox. Title: The adoration of Jenna Fox. Seventeen-year-old Jenna Fox has just awoken from a year-long coma - so she's been told - and she is still recovering from the terrible accident that caused it. But what happened before that? She's been given home movies chronicling her entire life, which spark memories to surface. But are the memories really hers? And why won't anyone in her family talk about the accident? Jenna is becoming more curious. But she is also afraid of what she might find out if she ever gets up the courage to ask her questions. I’m not a big fan of science fiction books or futuristic books, but sometimes, there are just books I can’t ignore. This one sounded great and it really surprised me. It’s another prove for me that reading outside your normal ‘box’ is a great thing to do. You will discover wonderful stories you normally wouldn’t read. This was one of those books. 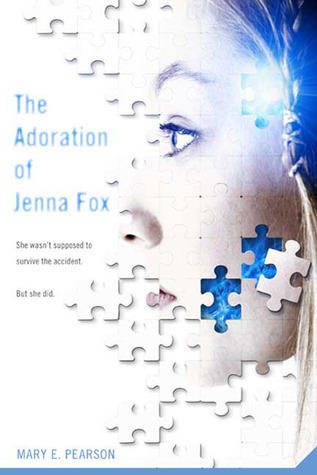 Jenna Fox awakes from a coma without any memory. She doesn't recognize her parents and even her own body feels strange. It's hard for her to get used to the whole situation, but she has the feeling that something is not right. That's when she discovers that she's illegal, because her parents kept her alive against the rules. There are rules in the society and Jenna shouldn’t be alive: nobody can find out that she is alive or they will be in a lot of trouble. One of her new friends finds out about the truth, but she gets very sick. Jenna's parents will help this girl in return for silence. Years and years later, you read how Jenna and this girl are still alive, while Jenna's boyfriend is dead.That part really touched me.. I don't know if I would like to live this way; the whole idea really freaks me out! I hope that our society will never be able to do stuff like this, because it will really mess things up. My conclusion; a very good book that touches me and sometimes even scared me. Loved this book, so I'm always ridiculously pleased when I read a good review of it! I mean it's not like I wrote it, so it's really silly, but when I see someone else was really touched I have to comment and give them a very geeky sort of virtual high five! This book gave me so much to think about. I liked the sci-fi element but I really just loved how much it made me think and question things. Ooh I LOVE sci-fi and futuristic (to some extent) books. PLUS, I love mysteries regarding memory loss so this one is definitely going on my wishlist! @Hilda, The ending was terrible, because it made me feel sad, haha. @Jenny, indeed, I like it when a story provides me with questions. @Mimi, surprises in reading are indeed the best! They can make me feel so happy.